For thousands of years people have shared stories. Tales of wonder and great journeys have been used to throughout the ages to chronicle history, share spiritual lessons, entertain, spread teachings, and inspire awe. Stories shape our values, worldview, and perceptions. They also have the capacity to foster empathy, compassion, and to connect with our subconscious. Reading is a fun and relaxing mindful activity for children. In addition to helping them excel academically, it’s also good for their health, wellness, and learning development. Another great way that reading can benefit children is by encouraging them to explore their emotions, concepts such as self-love, and acceptance. It can be challenging to get children to sit down and concentrate. If you’re a parent or a teacher, you know first hand what it’s like trying to captivate and maintain the attention of curious young minds. In our busy world, there are so many distractions that it’s easier now more than ever to engage in mind wandering and mental chatter. One of the great ways to help young ones learn to pay attention is through mindful practice. Whether formal meditations, yoga, art, or even just reading a book. Books are a great medium to share information with children. They’re also an effective and simple tool that can encourage self-awareness and emotional processing. Well crafted tales captivate attention, spark the imagination, and can even inspire self-reflection and positive change. Reading with children, whether at school or in the home can be a very beneficial mindful practice. In addition to helping with cognitive development, this kind of activity helps children learn how to focus, unwind, and understand both themselves and the world around them. Stories are part of your every day life. You experience them in books, on TV, through the news, social media, art, architecture, politics, and even in regular conversation with friends and family. Reading in particular is a great way to connect with stories. It provides lots of entertainment, information, and what many people don’t know – health benefits. Here are 8 great reasons why you might want to start setting aside regular reading time each day. Reading is good for your health. It promotes relaxation, lowers your heart rate, and even relaxes your muscles. Whether you are reading yourself or sharing a book with your children, reading positively contributes to feelings of happiness, self-confidence, and overall wellbeing. Additionally, reading time creates a positive and safe place for young people to safely discuss their thoughts and feelings. Reading is a simple and effective way to reduce stress. In fact, just 6 minutes of reading can reduce stress levels by 68% according to researchers from the University of Sussex. According to a recent study, most people working in the United States are stressed most of the time. Furthermore, one third of American parents have reported that their stress levels are extreme. According to the American Psychological Association (APA), most parents are unaware of the negative effects their stress has on the family. Adults aren’t the only ones who are feeling the heavy pressure either. A separate study conducted by the APA, found that 86% of children feel affected by their parents’ stress. Additionally, teens are often more stressed than adults. Over the past 20 years, childhood stress levels have increased. The effects of this on children and young adults can negatively impact both physical and psychological wellbeing. Studies published by the American Academy of Pediatrics have shown that parent-child reading promotes learning development. It helps increase understanding of language, print, narrative comprehension, and mental imagery. Other benefits include: increased vocabulary, better spelling, improved listening skills, and higher earning potential later in life. Parent-child reading has been found to be so beneficial for children that the American Academy of Pediatrics has recommended that families start reading to kids from birth and continue until at least kindergarten. You likely read a lot in your daily life: for work, housekeeping, emails, media outlets, advertisements, even recipes. But all of this reading generally falls into the “having to” category. It’s not often the kind of written material that bring pleasure. A lot of joy, wonder, and excitement is generated simply from reading a book. Unlike television which has been shown to demonstrate negative physical and psychological effects in children, reading has been found to do the opposite. It’s also fun, engaging, and can boost creativity. One of the great benefits that comes with reading is the broad topic range you can explore. For children, reading not only develops a new way of learning, but also helps to promote critical thinking, develops imagination, and helps shape their understanding of the world. Not to mention that stories can be engaging and fun ways to share information. Another great advantage that comes from books is improved self and cognitive development. Through reading, children can learn more about things that aren’t often discussed such as their feelings and coping with difficult emotions. Reading stories is a great way to create a sense of family and community. It brings children and people of all ages together in a calm, quiet, and safe space. Children notice very quickly when adults- their parents, guardians or teachers, aren’t paying attention. These are generally the opportunistic moments seized for mischief making. When reading is encouraged at home, it provides children with quality family time. This kind of regular bonding experience helps to develop trust, respect, and understanding. It also demonstrates to the kids that adults are willing to set aside time for them and that they’re valued at the home. This awareness helps build stronger relationships and mutual understanding. Reading teaches children how to relax. It encourages them to be still, present, and fully aware. Because most reading is done sitting or lying down, children learn how to stop doing and embrace stillness. In these moments of quiet and calmness, they can learn how to relax and unwind. This isn’t only important for children, but also the people who are reading with them. To be fully engaged in story time requires that adults also step away from their busyness and commit to being present in order to share the book. Another great reason to encourage reading with children is that it helps to foster empathy, both for self and others. Bullying, violence, and other forms of aggression are common problems in schools around the world. These kinds of hostile behavior and treatment of others create long-term negative consequences for all individuals involved. Reading can be a great way for children to develop and strengthen their empathetic muscles. It takes the focus away from “me” and extends a circle of compassion towards others. Empathy cultivates understanding and compassion, and can help both prevent and diffuse forms of aggression. Children and teenagers in the United States are experiencing very high levels of stress. Contemplative practices such as meditation and yoga have increased in popularity over the past ten years. Mindfulness-based activities are increasingly being recognized as management tools for stress, anxiety, depression, anger, chronic pain, and unsocial behaviors. They’re part of a growing trend of alternative healing methods used to tackle challenging issues experienced in professional, educational, and personal settings. These kinds of mindful practices are becoming more common in school settings thanks to the numerous positive effects they’re having in the classroom. Some of the beneficial outcomes of regular mindful practice with young people include: improved mental health, mood, academic performance, self-esteem, and overall wellbeing. Children are very sensitive to the wellness of their peers. Research has found that a student’s sense of personal well-being is partly dependent on the well-being of that of their classmates and relationship with their teachers. A recent study published in The Journal of School Psychology collected data from over 1000 teachers in the Pennsylvania Head Start Program. The purpose of the research was to discover how mindfulness-based interventions effected the relationships of preschool teachers and their students. Results of the study indicated that the greater dispositional mindfulness a teacher had, the better quality relationship they had with their students. Furthermore, this study also demonstrated that a child’s social and emotional competence as well as academic achievement can be largely predicted based on the kind of relationship they have with their teacher. The findings strongly suggest that mindfulness-based interventions in the classroom offer benefits for the well-being of both teacher and student by reducing stress and conflict, while fostering stronger relationships. Stories are a captivating way to share knowledge, values, and beliefs. They’re also a powerful vehicle for self-discovery. Reading is a great way to encourage positive self-reflection, awareness, and critical thinking. This helps children develop academically as well as on a more personal level. When children are encouraged to reflect on a story and its characters, either through role playing or discussion, they’re building empathy. They begin to see things from the perspective of others, and develop a broader understanding of the world. Additionally, through these practices, they’re also in a better position to explore their own thoughts, feelings, and difficult emotions. 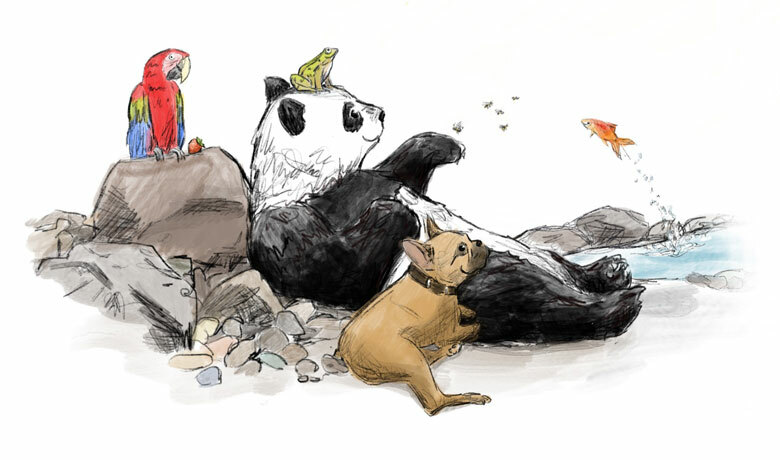 I spoke to mindfulness practitioner Julia Hahn, the founder and creative mind behind The Mindful Panda about the use of her stories in therapeutic settings. Julia’s experience as a Montessori teacher has taught her that “narrating facts to children is far from the best teaching method”. In her experience, she’s found that children are more receptive to learning in an indirect way such as through stories. Julia went on to explain that “by accepting and loving ourselves, we gain the ability to love others. This is where connection and belonging, two of our core needs as human beings start”. When you’re present, you’re expressing love– love for yourself, the planet, and other people. Mindful practice, whether through meditation, yoga, walking, or reading helps you learn how to return to your body and become more self-aware. When practicing mindful reading with children, you extend your field of awareness to others in your presence. This kind of practice creates a space where others feel acknowledged, heard, and accepted. This too is an expression of love. Storytelling has been practiced for thousands of years. It’s deeply engrained in our cultural and spiritual traditions, and is still very much a part of every day life. The act of reading itself has been shown to be beneficial for health, stress relief, and cognitive development. Stories are a great source of information, entertainment, and a perfect time for family bonding. Books can also be used as fun meditative tools for children. They can help promote focus, self-love, and mindful awareness while stimulating the imagination through entertainment and personal discovery. Mindful reading with children is a great way to encourage personal development, healing, and quality family time. 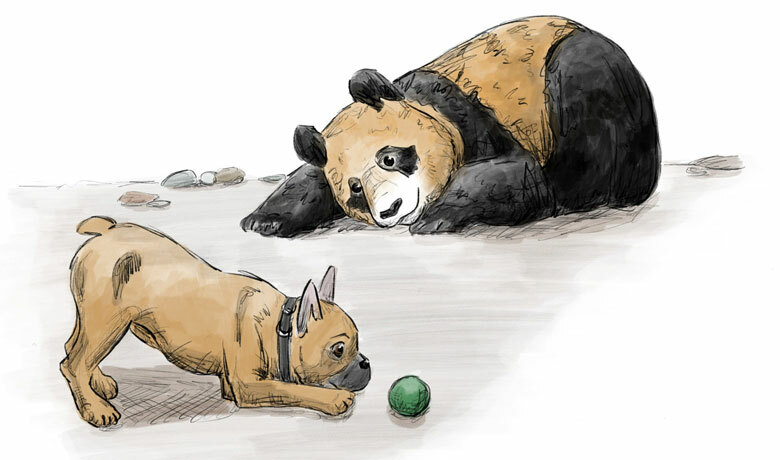 This post was written in collaboration with our friend Julia at The Mindful Panda. The Mindful Panda is a California-based company specializing in mindfully crafted educational tools for children. Their creative minds have beautifully incorporated Zen-inspired watercolor graphics and guided meditations into storytelling. 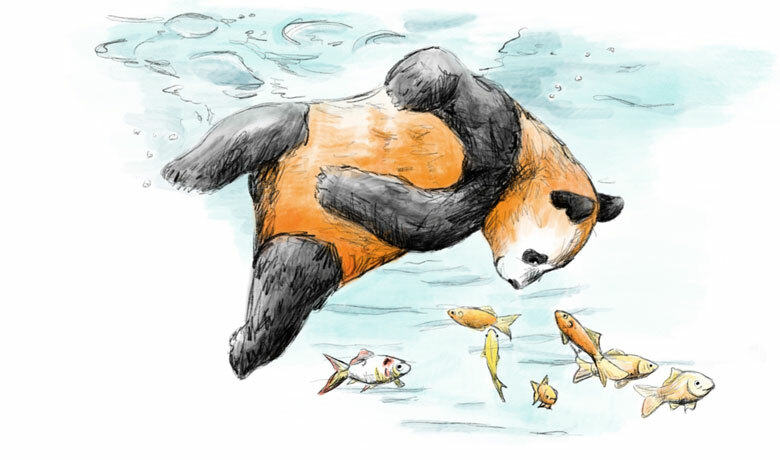 The Mindful Panda books and reading theatre convey a powerful message; as parents, teachers, and caregivers become more aware, so too do the children with whom they’re reading. These stories, although written for children, are meant as an interactive mindful practice shared amongst people of all ages. “Meditation changed my life. It made me discover the strength that lies within myself and brought healing and happiness into my life. I want to help children to use this wonderful tool as early as possible.” – Julia Hahn, Founder of The Mindful Panda. This is so awesome! I absolutely love the illustrations! What a great post and so much useful information. Really need to focus on being present and committing time to practice. Especially with the family. Thnx for sharing! We really need more books like this- not just for our children, but for us as well. Fantastic post and looking forward to reading the book.